So I'm there by myself in the Sony booth looking at the display case of NEX lenses (the counters were packed, and I wanted to see the full line in one spot) when I seem to be surrounding by Koreans, taking notes. A cursory glance shows Samsung badges. A closer look shows that most haven't covered up their business identification, so they are...yep, high execs and NX designers. And they're discussing technical specifications with great animation, obviously comparing the size of theirs against the size of someone else's and in a couple of cases feeling like they've come up short. Also obvious is my press badge, which they don't notice. Now, most of the conversation was in Korean, so they have that going for them, but it was pretty clear to me what they were most interested in and what they were discussing. Are you sure you want to do that in public, Samsung? They also didn't notice as I followed them as they did a little tour of things in the Sony booth, continuing to get into animated discussions about certain things. Okay, I can guess what changes we'll be seeing in NX now, thank you Samsung! To bad I don't run a rumor site. Think Tank Photo CityWalker 10—I'm still looking for that perfect mirrorless kit carrying bag. The CityWalker 10 comes close. These messenger style bags use a removable "tray" that is designed for holding camera gear, and can fit a tablet (or maybe a small ultralight), as well. The US$125 CityWalker 10 is the one I'll likely try out. It looks like I could buy three trays (one for m4/3, one for NEX, one for Fujifilm X), configure them for my basic systems, and swap them in and out as needed. Think Tank doesn't quite get the serious mirrorless user. Their mainstay has been working sports and PJ pros who travel. But they do listen to users. So I'll see if I can get them to tailor a bag that's a little more mirrorless oriented. But I'll start by seeing what I can do to a CityWalker 10, because it's the right size and the removable tray will allow me to do some customization. I've been using their Airport bags for overseas travel for quite some time: they hold up very well to abuse. Their point: that the X-trans performs more in the full frame sensor range than the APS sensor range of their competitors. Since I've reviewed five of the six cameras on that chart, I'd tend to agree with the overall assessment, though it is a little more nuanced that Fujifilm make it out to be. 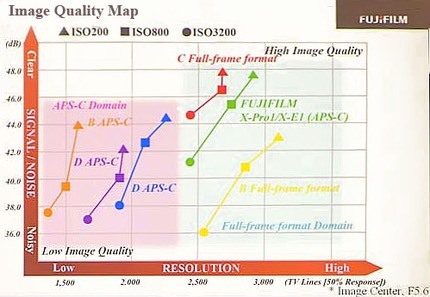 Some of the resolution differential is lenses, even at the center f/5.6 test points Fujifilm uses. 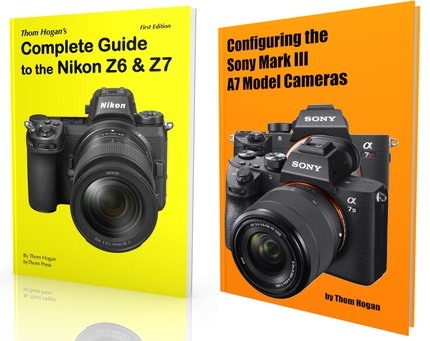 Still, probably a valid point: the APS sensor mirrorless cameras are extremely good, but we've got two outliers that do some things better: the Leica and the Fujifilm. Just remember the potential for color smearing in certain low level detail, which Fujifilm continues to pretend doesn't exist. I picked this slide, though, as it's a rare example of a camera company trying to point out a fact-based benefit to customers. Most of the time we just see them use vague words that can't really be backed up by real world testing. Overall, Fujifilm continues to one of the few camera companies that still remember what feature/benefit marketing is all about, and who make very straightforward, testable arguments in their presentations. They need someone to put some real polish on those messages though. The above slide is part of the argument that more resolution with low noise is what makes detail sparkle and gives you exceptional acuity in an image. And Fujifilm's X-Trans cameras get you closer to the desired upper right corner than the competitors. Curiously, Fujifilm also said it's considering making a full frame mirrorless camera. The X-mount is large enough to cover it, though a couple of their wide angle lenses might not have a wide enough image circle (I suspect the upcoming 14mm doesn't, for example). Blackmagic Cinema Camera—Okay, I have to take back something I wrote last month: the m4/3 mount version of the Blackmagic makes sense. I've either come to my senses or been brainwashed, take your pick. The detail I hadn't picked up on was how small the Blackmagic sensor is. m4/3 is a more natural size for it, and restores wide angle capabilities for it. All the fast primes being made—especially ones like the geared versions SLR Magic is making—make great sense on the MFT version of the camera. I apologize to any Aussies who thought I'd gone clucky. I just went mentally walkabout for a bit, mates. So good onya, and I now think the MFT deserves a nice big pash. Aptina 1" Sensor—Aptina was showing a licensable sensor very close to that used in the Nikon 1: 1", 10mp, 60 fps for the full frame grab, and so on. There were a few differences. No embedded phase detect autofocus sensors, and apparently 120 fps 1080P support, for example. Aptina also was showing why this sensor performs so well: it has a variable approach to holding electrons depending upon brightness. Now we know why there were those slight changes to the curves in DxO's raw data: the sensor tries to collect electrons optimally at each cell depending upon whether it's recording shadow or highlight detail. It's almost a bit like bringing back reciprocity failure (a feature of film's response to extreme levels of light), but optimized for digital signal-to-noise. Leica M Sensor—We're learning more about the CMOSIS sensor inside the M. One thing that all Leica M users (on Leica cameras or adapted to others) have had some struggle with is edge to edge color changes and vignetting. The rule of thumb in sensors has always been that light needs to hit a no more than 15° off of vertical in order to be fully captured by a photosite. Wide angle lenses (and some fast aperture lenses), especially the Leica designs, tend to throw light at higher angles than that towards the sensor. This has a couple of unintended consequences towards edges: Bayer color spillover happens between adjacent photosites, and some of the extreme edge light gets "shadowed"—basically run into sides of the tunnel between the filtration and the actual photodiode. The CMOSIS sensor attempts to correct this problem with a different microlens design, one that bends the light more dramatically towards perpendicular. As you'll see me write elsewhere Leica really has been listening to user feedback, and it appears that they've come up with (at least partial) solutions for every complaint they've heard. Other aspects of the sensor that might be of interest to some are the fact that it has a linear full well capacity of just over 40,000 electrons and linear dynamic range of almost 76dB. The sensor uses 14-bit column AD converters and digital correlated double sampling, much like the recent Sony sensors. There's no word on the rolling shutter speed, but it does have a rolling shutter. Maximum sustained frame rate from the full sensor is 5 fps. The truly interesting thing, and dangerous thing to the big sensor makers, is CMOSIS is another of those European disrupters, with little facility investor, using cooperation and consolidation of existing technologies to serve up specialty products. CMOSIS doesn't have a fab. Heck, it has less than 50 employees. This is the "move fast, do the right R&D, use the best resources" type of company that is dangerous to the companies with huge sunk facilities costs that also get locked into specific R&D strategies. At one time Nikon held more than 50% of the stepper market (the machines that make [fab] semiconductors). Heck, Nikon and Canon together held 75% of that market as late as 2001. ASML was a different beast than the Nikon/Canon stepper divisions: ASML basically integrates other parts from other companies into a better stepper, sort of pick and choosing best technologies rather than putting down large bets on a few. What was the market share 10 years later? ASML 57%, Nikon 28%, Canon 15%. And ASML is still a pretty lean company at 8000 employees total. CMOSIS looks to me like another ASML: tie together key technologies, work closely with customers (in this case Leica), create the solution and fab (make) it at the best provider. We're going to see more of this in the future. 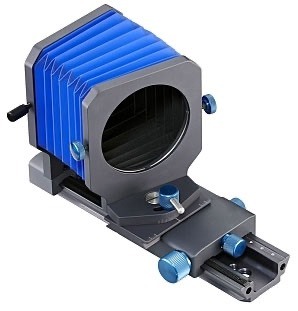 Novoflex Tilt and Shift Bellows—Given that you can adapt pretty much any lens to these short back focus mirrorless cameras, it was only a matter of time before we got things like the Novoflex Castbal T/S bellows, which mounts to their Castel-Q macro focussing rack. Pop on the right adapters out back and up front and you've got tilt-shift for your mirrorless camera.